CCI indicator oscillates between an overbought and oversold condition and works best in a sideways market. function is used multiple times in a formula. With several amendments over the years, India provides a good opportunity for Algo traders due to a number of factors such as co-location facilities and sophisticated technology at both the major exchanges; a smart order routing system; and stock exchanges that are well-established and liquid. Algo trades account for over 43% of India’s stock market turnover. In the US, where retail investors also engage in Algo trades, 90% of the turnover is from automated systems. The global average is 75%. SEBI was among the first regulators to issue a discussion paper proposing strengthening of rules on Algo trading in August 2016. With rules in place, Algo trades in India will rise to the global average, market participants said. There are a lot of startups in this space waiting to enter once rules are in place. This will be a big boost for Algo trading. Greeksoft Technologies: One stop solution for all your trading needs. It’s all about High Frequency Trading . Algorithms – step-by-step mathematical procedures – generate automatic trades, conducted by computers, each one racing to be first. And while some computers do receive news about the outside world in electronic format, many high-frequency trading algorithms are simply responding to the hectic world of the electronic trading floor. Humans still watch the systems, but the computers move far too quickly for us to react to everything they do. To give you a sense of how fast high-frequency trading can be, in the time it takes Usain Bolt to react to the starting pistol, a high-frequency trading platform could complete about 165,000 separate trades. Now this isn’t quite as insane as it sounds. These computers, all competing with each other, are a lot cheaper and more efficient than human traders trying to match bids to buy and offers to sell. So within reason, automated, high-frequency trading is a good thing. But it’s possible to have too much of a good thing. First, there are algorithms designed not to lose money while executing a trade that’s been placed by a human. If you try to buy a large block of shares all at once, for instance, you might find that there aren’t enough potential sellers and you’ll have to wait for others to show up. 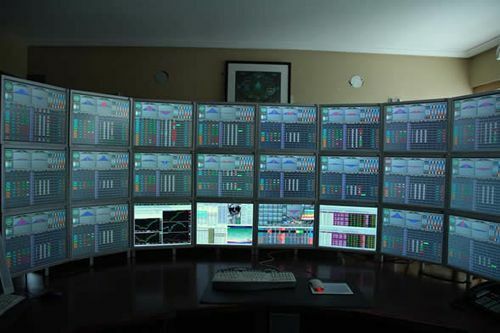 Other computers may see that you’ve got this large unfilled order and exploit it, perhaps by snapping up shares and selling to you at a profit. To avoid this problem you can ask a computer to slice up your big trade into smaller, more subtle pieces. Then there are algorithms designed simply to make money by finding buyers and sellers with a little margin between them. Third, there are algorithms which find statistical relationships between different shares or bonds, and when the statistical relationship fails to hold – even for a moment – they jump in and make a bet that normal service will be resumed. These are called statistical arbitrage algorithms. So far, so good – it would be hard to find many people in finance who would consider these three types of high-frequency trading to be immoral. But there are two rather more predatory strategies. One is called algo-sniffing. Here, a super-fast computer tries to find other computers going about their everyday business of buying or selling shares, and figures out what they’re going to do and when. The algo-sniffer can then get ahead of the game and exploit the slower computer. And of course you could have algo-sniffer-sniffers and algo-sniffer-sniffer-sniffers in a high-frequency arms race. No wonder speed can be so important. And finally, a particular sub-category of the algo-sniffer is the spoofer, which deliberately makes fake offers designed to lure other computers to show their hands, then cancels the offers. Spoofing might be illegal, or at least against the rules of stock exchanges, but it’s hard to prove that it’s going on.